UK ministers unveiled the sweeping new proposals last year in a bid to tackle the threat from so-called foreign fighters. The act allows Home Secretary Sajid Javid to designate an area, dependent on parliamentary approval. There are exemptions written into the legislation to protect those that have legitimate reasons to be in ‘designated areas,’ but campaigners fear that varying interpretations of the new laws could see journalists being locked up. Free press and free speech groups, including Reporters Without Borders and Index, warn that due to the vague nature of the new counter-terrorism act, it could lead to a crackdown on journalists’ freedom to travel if they fail to answer questions. A journalist taking a domestic flight could be stopped without any suspicion of wrongdoing. It would be an offence for the journalist not to answer questions or hand over materials, with no protection for confidential sources. A UK cross-party committee report on human rights last year, warned the government that the new powers on counter-terrorism risk crossing the line on human rights, restrict freedom of speech and place obstacles on access to information. John Pilger, as foreign correspondent, covered Bangladesh’s Liberation War. His front-page report ‘Death of a Nation’ alerted the world to the life-and-death struggle of the Bengali people. He has been a war correspondent, author and documentary filmmaker who has won British journalism’s highest award twice. For his documentary films, he has won an American Television Academy Award, an Emmy, and a British Academy Award given by the British Academy of Television Arts. He has received the United Nations Association Peace Prize and Gold Medal. His 1979 documentary, Cambodia Year Zero, is ranked by the British Film Institute as one of the 10 most important documentaries of the 20th century. He is the author of numerous best-selling books, including Heroes, A Secret Country, The New Rulers of the World, and Hidden Agendas. In an exclusive (electronic) interview with Eresh Omar Jamal of The Daily Star, Pilger talks about his coverage of Bangladesh’s Liberation War, the state of journalism today, and the current political shifts happening in the West. Eresh Omar Jamal: In an article for The Guardian in 2008, you wrote that when you came to cover Bangladesh’s Liberation War in 1971, Bangabandhu Sheikh Mujibur Rahman’s wife Sheikh Fazilatunnesa Mujib had asked you, “Why have you come when even crows are afraid to fly over our house?” But you didn’t write your answer. Can you share what it was? John Pilger: I had spent much of 1971 based in Calcutta reporting on the seven million refugees coming from what was then East Pakistan. Their journey was along what we reporters called a “corridor of pain”. The previous year, I had witnessed the devastation caused by the great tidal wave that engulfed the unprotected Bay of Bengal. What had struck me was the lack of real concern by the government in Islamabad, which sent the army to impose martial law on the people of East Bengal. Which Journalists Work Nowadays for the CIA? Hundreds of Yellow Vest protesters gathered outside France’s BFM TV station for week seven of nationwide protests. The protesters chanted various versions of “Fake news journalists come down,” and “Macron out!” at the TV station which one protester told RT France spreads false information about the movement, while purposefully understating the size of its demonstrations. Saturday’s protesters were met with tear gas and a heavy police presence, which has become part and parcel to the violent demonstrations of weeks past. Police fired tear gas at “yellow vest” demonstrators in Paris on Saturday but the turnout for round seven of the popular protests that have rocked France appeared low. Protesters reportedly torched several cars next to the TV station, with the smoke visible against the Eiffel Tower. Separately, French police deployed tear gas in the city of Rouen in Normandy during a tense stand-off with demonstrators. The U.S. government can monitor journalists under a foreign intelligence law that allows invasive spying and operates outside the traditional court system, according to newly released documents. Targeting members of the press under the law, known as the Foreign Intelligence Surveillance Act, requires approval from the Justice Department’s highest-ranking officials, the documents show. In two 2015 memos for the FBI, the attorney general spells out “procedures for processing Foreign Intelligence Surveillance Act applications targeting known media entities or known members of the media.” The guidelines say the attorney general, the deputy attorney general, or their delegate must sign off before the bureau can bring an application to the secretive panel of judges who approves monitoring under the 1978 act, which governs intelligence-related wiretapping and other surveillance carried out domestically and against U.S. persons abroad. The high level of supervision points to the controversy around targeting members of the media at all. Prior to the release of these documents, little was known about the use of FISA court orders against journalists. Previous attention had been focused on the use of National Security Letters against members of the press; the letters are administrative orders with which the FBI can obtain certain phone and financial records without a judge’s oversight. FISA court orders can authorize much more invasive searches and collection, including the content of communications, and do so through hearings conducted in secret and outside the sort of adversarial judicial process that allows journalists and other targets of regular criminal warrants to eventually challenge their validity. The documents were turned over by the Justice Department’s Office of Information Policy to the Freedom of the Press Foundation and the Knight First Amendment Institute as part of an ongoing lawsuit seeking the Trump administration’s rules for when and how the government can spy on journalists, including during leak investigations. Freedom of the Press and Knight shared the documents with The Intercept. The author is a retired CIA officer who spent 20 years on assignment in Europe and the Middle East. He is Executive Director of the Council for the National Interest, a Washington-based advocacy group which seeks to change the Israeli-centric nature of US foreign policy in the Middle East. Giraldi has emerged as one of the most outspoken and influential critics of Jewish and Israel influence on American foreign policy, an influence which he believes is pernicious. He publishes at the Unz Review. Here is the archive of his excellent articlespublished on RI. To be sure, Iran, threatened as it is from all sides, has certain aspects of a security state. And as what is essentially a partial democracy run along religious lines, it has very clear limits on what constitutes acceptable behavior. But I think the representatives of the thirty or so countries who attended the congress would agree that there was no attempt made to limit free speech or guide discussions. The only attempt to censor the conference and its content has been, I would note, the blocking of sponsor New Horizon’s website on Google and presumably elsewhere in the Zionist/U.S. dominated social media and information-searching world. Indeed, the only coordinated activity that might have been noted at the conference itself was the loud hissing noise that accompanied any mention of the name John Bolton. Indeed, there was clear criticism of the nature of the Iranian government openly expressed at the conference as well as very heated exchanges on a number of issues surrounding Jewish identity, Israel, the Palestinians, the status of Jerusalem and the Joint Comprehensive Plan of Agreement (JCPOA) on the Iranian nuclear program. There are a lot of issues surrounding the case of Sergei and Yulia Skripal which, at the time of writing, are very unclear and rather odd. There may well be good and innocent explanations for some or even all of them. Then again there may not. This is why it is crucial for questions to be asked where, as yet, there are either no answers or deeply unsatisfactory ones. Some people will assume that this is conspiracy theory territory. It is not that, for the simple reason that I have no credible theory – conspiracy or otherwise – to explain all the details of the incident in Salisbury from start to finish, and I am not attempting to forward one. I have no idea who was behind this incident, and I continue to keep an open mind to a good many possible explanations. 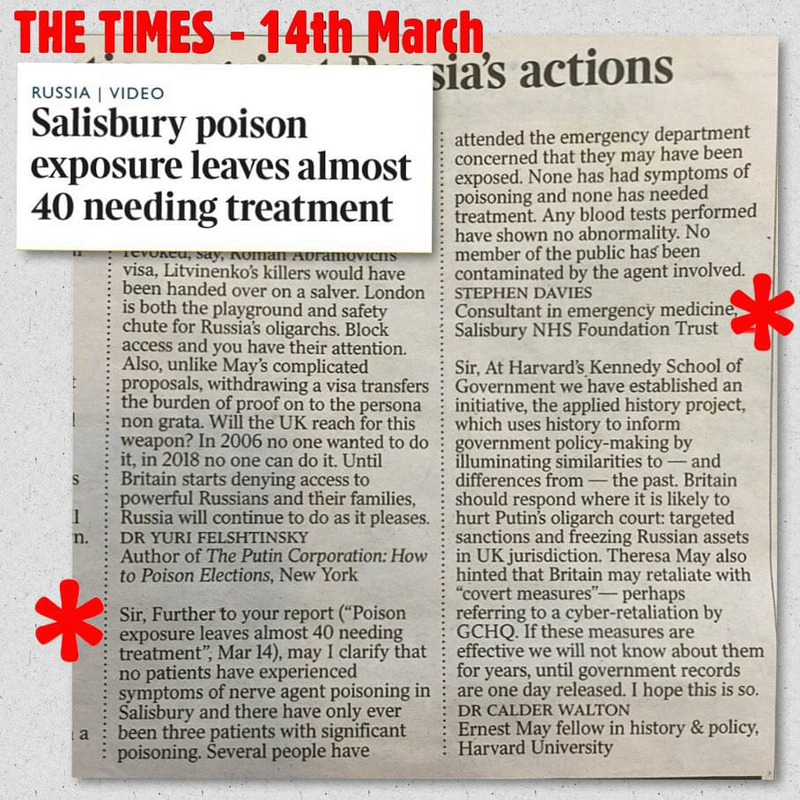 His claim that “no patients have experienced nerve agent poisoning in Salisbury” is remarkably odd, as it appears to flatly contradict the official narrative.